This week’s state visit by Chinese President Xi Jinping to the UK marks a "Golden Era" of UK-China relations. I was delighted to attend his address to Parliament yesterday where he spoke of the vitality of China-UK relations. During his visit to China last month, the Chancellor George Osborne said that the UK is "China's best partner in the West". This is also true of our Intellectual Property cooperation. Today I attended the UK-China Symposium in London. It brought together senior IP policy makers, IP judiciary and businesses for a day of open discussion on the UK and Chinese IP systems. The event allowed British and Chinese businesses to gain a better understanding of their respective IP environments. It also enabled them to share best practice on protecting and enforcing their IP. I am clear that the UK should be the most innovative place to do business and a strong IP system plays a big part in that. By working with China we can bring even more benefits to the UK. Last year, I led the largest ever UK IP delegation to China. It included representatives from British companies, industry associations, the judiciary and senior government officials. During my visit I facilitated an agreement between Alibaba and the China Britain Business Council (CBBC) to support British businesses. Alibaba accounts for the majority of the booming Chinese e-commerce market. Sales on Alibaba platforms exceed the global sales of Amazon and eBay combined. The agreement has ensured British companies achieve the best outcomes from Alibaba's IP protection systems. It is estimated that these measures have helped to remove around £8 million worth of counterfeit versions of British goods. Congratulations to Alibaba and the CBBC on this achievement. The agreement has improved the e-commerce environment, making it safer for consumers and the small businesses that use Alibaba sites as part of their supply chain. However there is still work to be done on ensuring such behaviour becomes "business-as-usual". China is a key priority of the UK’s trade and investment strategy and we aim to make it the UK’s second largest trading partner by 2025. The UK is already the most popular destination in Europe for Chinese investment. But our relationship goes far beyond trade. China is a leading global source of funding for scientific research, with R&D spending reaching 2.9% of GDP in 2014. Many of us in the IP sector have been amazed at the output of this research in China. More than 900,000 invention patent applications were submitted to the State Intellectual Property Office in China last year alone. The UK is also a world leader in innovation with strong university-industry links. We have 4 of the world’s top 10 universities. Our companies and universities have experience of taking innovation to markets across the world. The UK and China are jointly investing £200 million in science and innovation projects over 5 years. There are many advantages to joint research as they generally produce better outcomes than when a single nationality works alone. Unfortunately there are some barriers to joint research. Unfamiliar academic cultures, business environments and IP systems can make life difficult. That is why today the IPO has launched a collaborative research IP toolkit to tackle these problems. It will safeguard £65 million per year in joint UK-China research and innovation. It provides a clear framework for negotiating how IP will be managed in joint research projects. I also announced today the first set of research projects to be funded by the UK's Arts and Humanities Research Council (AHRC) and the Ningbo local government in China. The AHRC has provided £500,000 in matched Newton funding to establish a China Digital Copyright and IP Law Research Centre at Nottingham University in Ningbo. All countries face similar challenges adapting their IP systems to the digital age. This research centre will allow the UK and China to share their expertise and will create innovative approaches to tackling these issues, which will benefit UK businesses. Today's announcements show that the UK is willing to listen to and provide solutions to businesses that have IP issues. As China continues to reform and strengthen its IP system, the UK will continue to maintain our cooperative relationship. I believe that the UK-China IP Symposium will contribute to this process and will help to increase trade, investment and innovation between our two countries in the future. Follow the Intellectual Property Minister, Baroness Neville-Rolfe on Twitter. 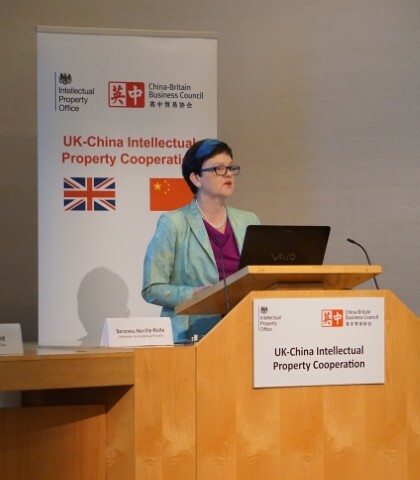 I attended the Baroness' speech at the China UK IP Symposium and it was delivered with passion.